Did you know the King of the Pecos was from Tennessee? 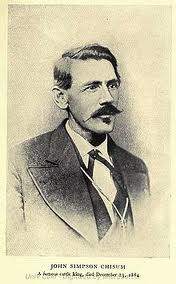 Born in Hardeman County in 1824, John Chisum’s family moved to Texas when he was a teenager. As Chisum grew older, he became a leader in the booming cattle industry of the area and provided beef for reservations in New Mexico. As a result, Chisum moved his operation to a 100 mile range on the Pecos River. With his 60,000 head of cattle, Chisum became known as the King of the Pecos. As his wealth grew, other cattlemen challenged Chisum’s power, and the famous Lincoln County War ensued, an event that made Billy the Kid famous. Chisum died in 1884, but he has been immortalized on film by such stars as James Coburn and John Wayne. While the portrayals have not been accurate, they have made for some entertaining movies and memorable quotes. Consider the following from Wayne’s Chisum. James Pepper: You know there’s an old saying. There’s no law west of Dodge and no God west of the Pecos. Right, Mr. Chisum? John Chisum: Wrong, Mr. Pepper. Because no matter where people go, sooner or later there’s the law. And, sooner or later they find God’s already been there.